They were born in a nightmare zoo — and she was the only one who could help them. 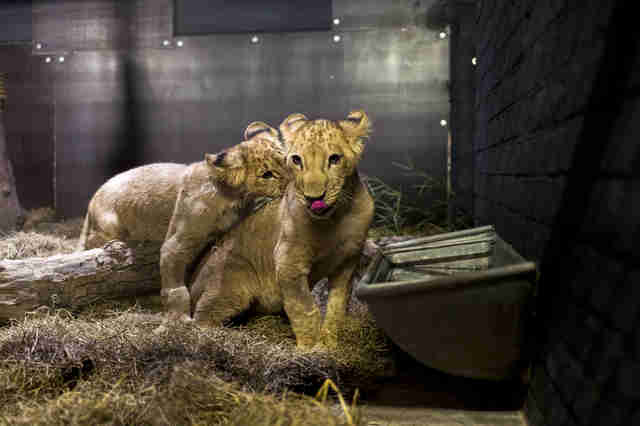 As soon as they were born, the odds were against two little lion cubs now known as Masoud and Terez. 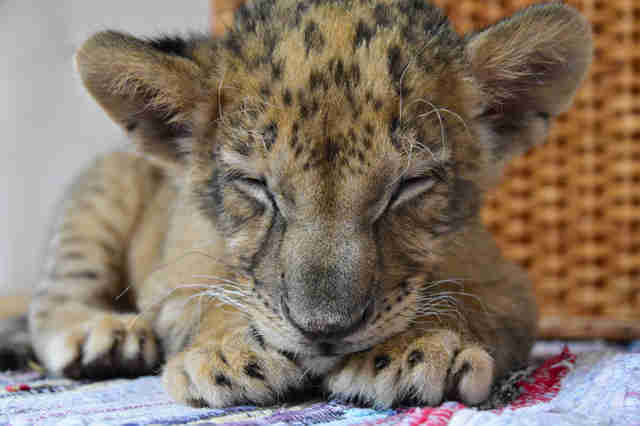 Their parents were being kept in an unlicensed zoo in Razgrad, Bulgaria, which was breeding lions and selling them to keep the facility running. 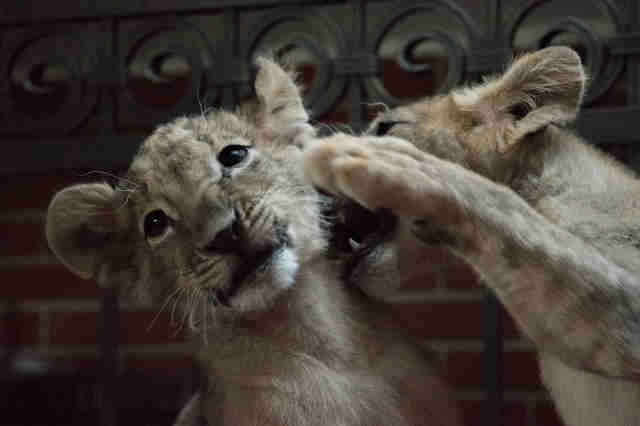 Masoud and Terez's parents were genetically related, too — and so the little cubs had all kinds of health problems. Not only that, their parents — suffering from the stress of cramped cages and poor nutrition — rejected them. By the time people learned about the cubs, it was almost too late to help them — but not quite. 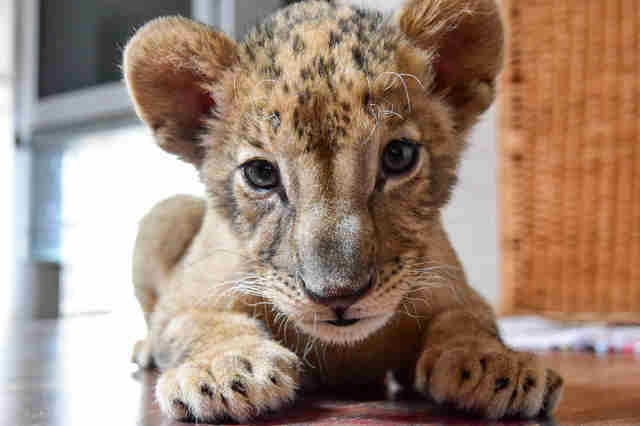 An animal organization based in Sofia called Wild Animals got a call in October from a concerned citizen who had visited the zoo and witnessed a fully grown lion accidentally trample a newborn cub. But the organization didn't specialize in rescuing big cats, like lions. “Initially I was shocked," Lubomila Krivoshieva, director of Wild Animals, told Balkan Insight. "I said, there is no way to take in lions, this is absurd!" At the same time, they knew they couldn't leave the cubs where they were. 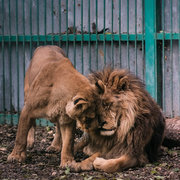 Luckily, at the same time, Four Paws International was investigating the zoo, trying to coordinate the rescue of its lions. 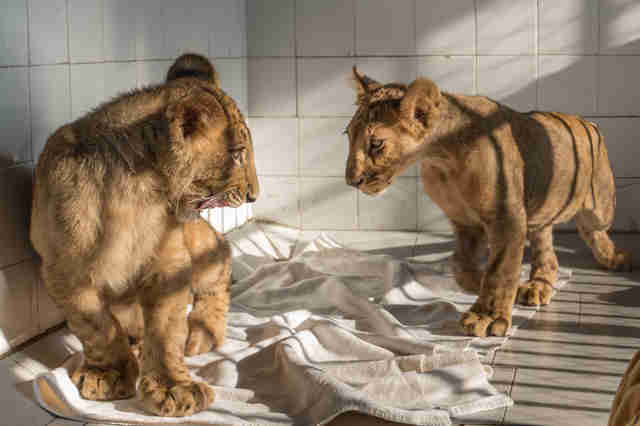 And one person stepped forward to take on the task of trying to raise the cubs: Marina Georgieva, a volunteer with Wild Animals, was determined to save Masoud and Terez. Normally, it's best for cubs to stay far away from humans, as they can't be raised well away from their own kind. But because they had nowhere else to go, people realized handraising was their last option. Georgieva tried to keep them safe until they could move to a real rescue facility. 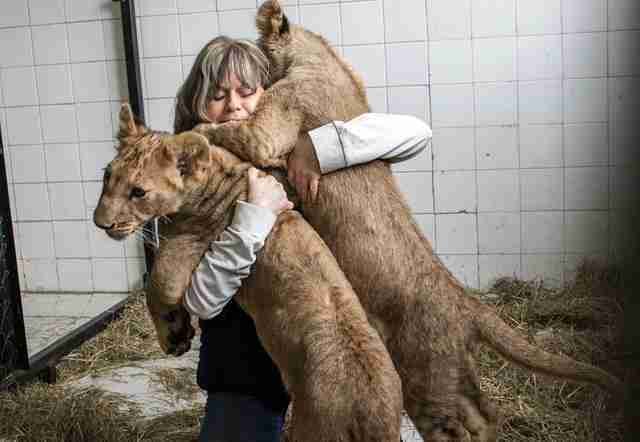 For five months, she was their mother, bottle-feeding the cubs and tending to their needs 24 hours a day. "These five months were the hardest months in my life," she told Four Paws. "I had to stop caring for my family. I didn't go to work for five months." Even though people doubted whether the cubs would survive, Georgieva managed to raise them into healthy young cubs. 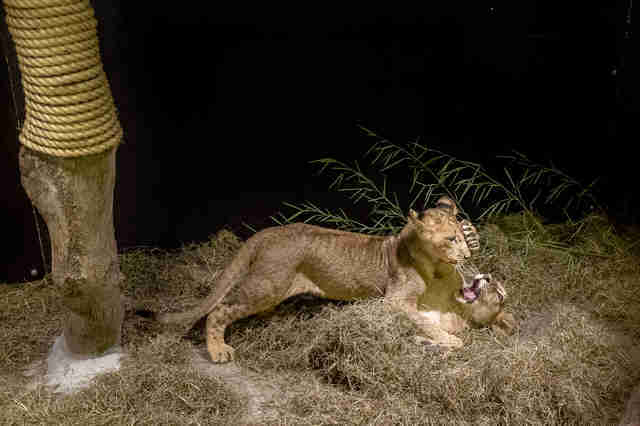 And soon it was time for them to separate from her, so they could grow up feeling like real lions, not a person's pet. But it was unclear where they would be able to go. No one wanted to see them return to any kind of substandard zoo. And it wasn't clear whether the authorities would let them leave the country. But the public had grown to love Terez and Masoud — and they were willing to take a stand for them. While Four Paws negotiated with the government to let Terez and Masoud go to a sanctuary, people held a rally to show support for their transfer. "Fortunately, thanks to the support of the Bulgarian prime minister as well as the tireless efforts of the Bulgarian public, the permissions to transfer the cubs were eventually granted," Four Paws wrote in a release. "The Four Paws team did not waste any time and was on their way to the Netherlands as quickly as possible." Georgieva accompanied the cubs all the way from Bulgaria to the Netherlands to make sure the cubs she raised got there safely. And finally they arrived at FELIDA Big Cat Center in Nijeberkoop. 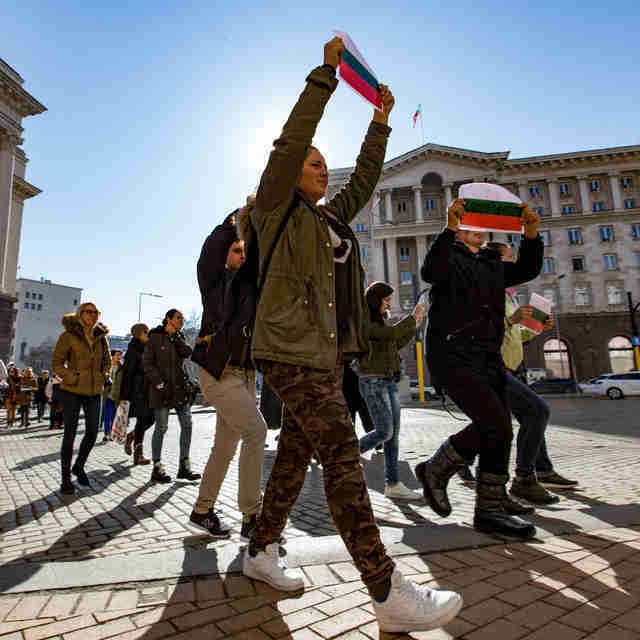 Once she knew the young lions were in good hands, Georgieva hugged them goodbye. "We are very happy that the situation took a positive turn and that we could bring Masoud and Terez to species-appropriate surroundings," Dr. Marina Ivanova, veterinarian and country director of Four Paws Bulgaria, said. "Given Terez's health condition, he urgently needs daily monitoring and a special diet to treat his poor development. From now on, they can recover from their past suffering." Rescuers hope that eventually the cats housed at FELIDA will be able to make the long trip to LIONSROCK, Four Paws' big cat sanctuary in South Africa, where they can enjoy larger enclosures in their natural habitat. 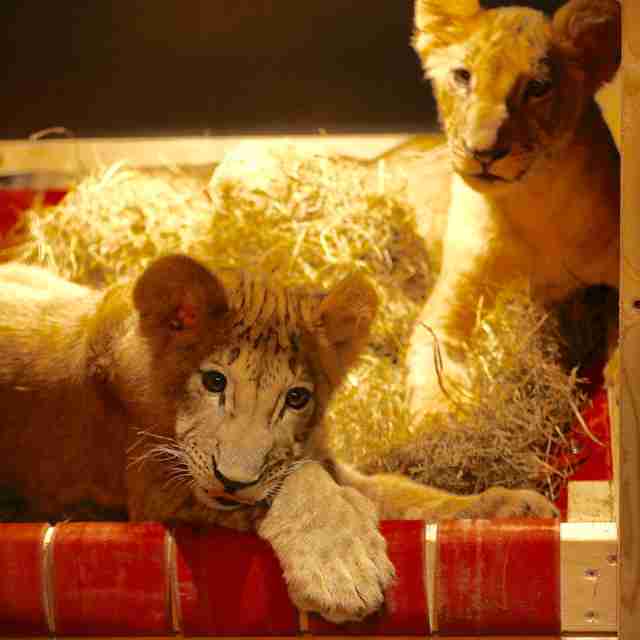 For now, they seem pretty happy to be in a place where they can recover and continue to grow up into adult lions. Already the siblings have been making full use of their new home by tackling each other in piles of hay. Once they're older and healthier, they won't need to interact with humans at all. Now that the cubs are out of her hands, Georgieva can go back to her normal life. And she was sure to thank her husband for his willingness to turn his home upside down for Terez and Masoud. It was clearly worth the trouble. You can help Four Paws with more massive rescues like this one by making a donation.